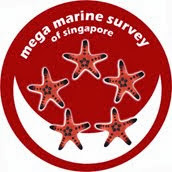 It's the second day of reef survey for the Comprehensive Marine Biodiversity Survey (CMBS) Southern Expedition. At 3am, bigger group of staff, scientists and volunteers gathered at the dinning area for breakfast. There are 3 teams heading out for reef survey this morning, all to different locations - Big Sisters' Island, Terumbu Bemban and Beting Bemban Besar. It was important to sort the teams right before boarding the 2 boats by Summit Marine System. Terumbu Bemban and Beting Bemban Besar may just be next to each other, but efficiency in transporting the correct people to the correct location is crucial as we have limited time on the exposed submerged reef due to the low tide window. Pre-departure briefing and boat sorting. I covered Terumbu Bemban today with 9 other members. I did not take much photos as I was busy collecting animals or rather playing chase with some animals. However there were some animals that I could not resist not photographing. 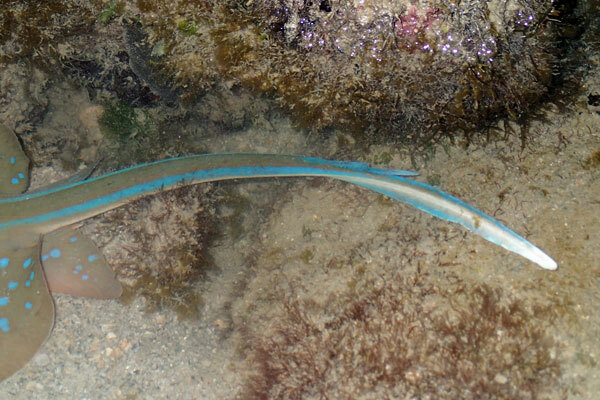 One of the interesting animals was a hiding Anchor tuskfish (Choerodon anchorago). It has pretty coloured spots on its cheek. 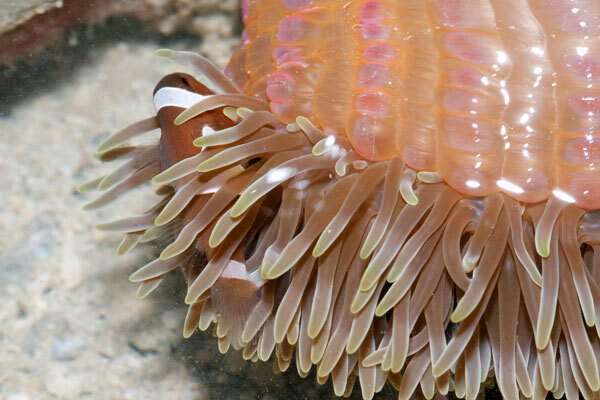 On one of the Giant carpet anemones (Stichodactyla gigantea) I saw about 5 False clown anemonefish (Amphiprion ocellaris) of various sizes. 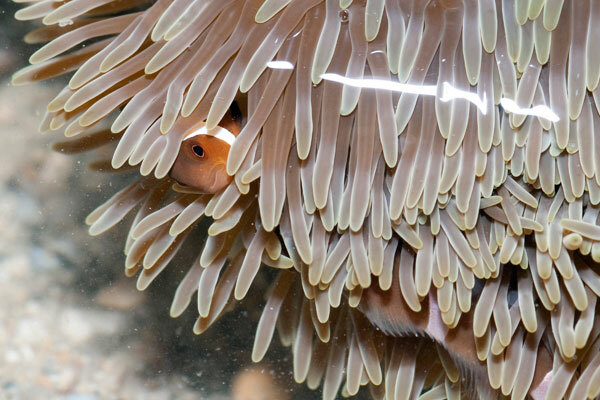 They were wiggling around at various spots on the Giant carpet anemone. 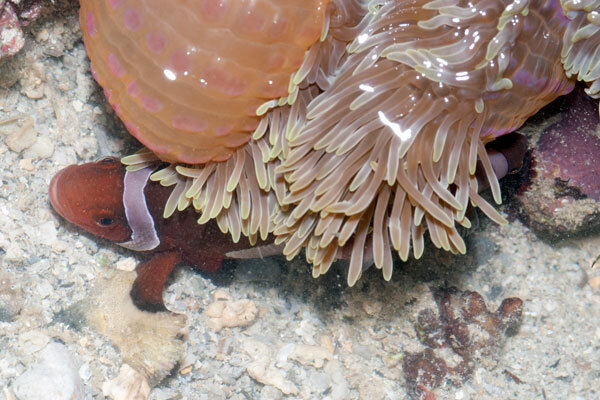 I did not notice a shrimp on the Giant carpet anemone until I processed the photos. I am not sure of the identification of this shrimp. Can you spot the shrimp? 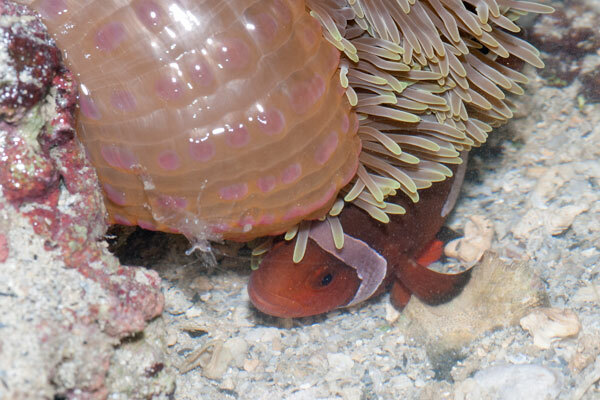 When working before sun rise in our submerged reefs, it is very important to know where you step. In ankle deep pools of water there may be Blue-spotted fantail rays (Taeniura lymma) resting around. 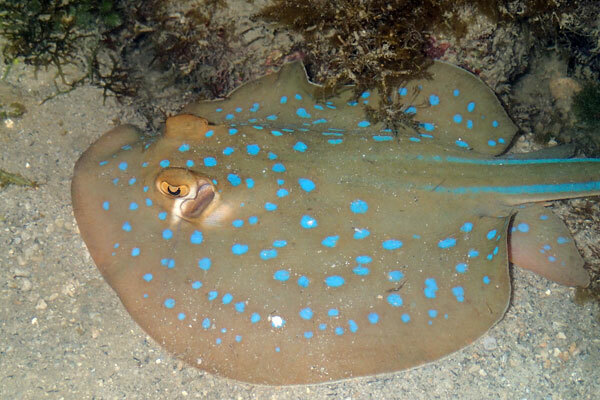 The rays have venomous spines near the middle of their tails and is capable of piercing into our feet through the booties if we are not careful. However close encounter with these gentle creatures is possible. Close up on the body. Fantail with visible spine at end third. 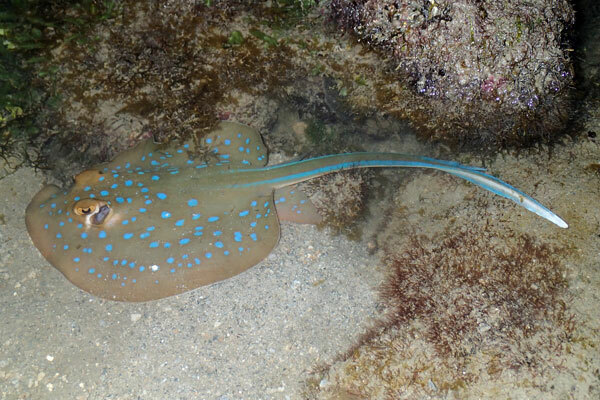 Here is a video of the Blue-spotted fantail ray moving in the shallow pool. 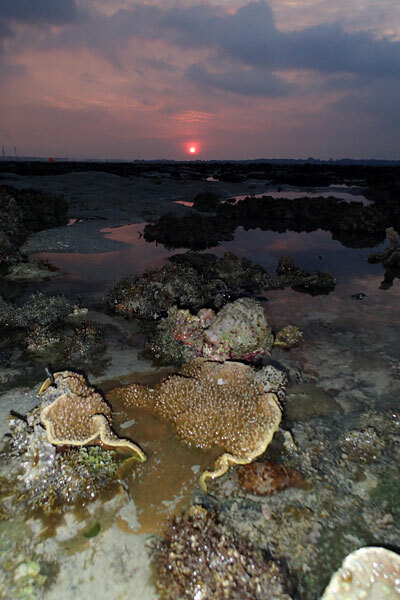 Today, we are treated with great sun rise over Pulau Semakau on Terumbu Bemban. As we were about end the trip, Rene spotted a Fluted giant clam (Tridacna squamosa) along the reef edge facing Beting Bemban Besar. A GPS reading of its location was taken. Giant clam is also another animal that makes me excited about. I think I attempted to collect an octopus for at least 4 times before I finally succeeded. 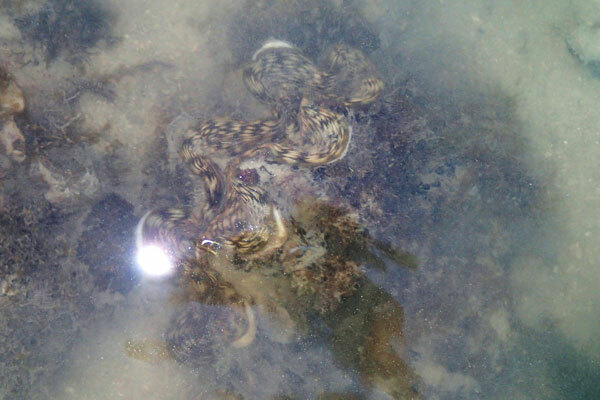 It was not easy as the octopus is very smart and escapes quickly. That is all the reef survey I am doing. 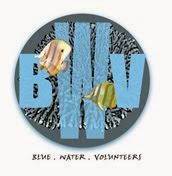 The rest of the reef survey sessions clashes with work commitment. However I will be back at base camp the coming weekend for more volunteering and fun. Next Sunday is a day off at base camp and some of us are going to spent some time having fun around the place. 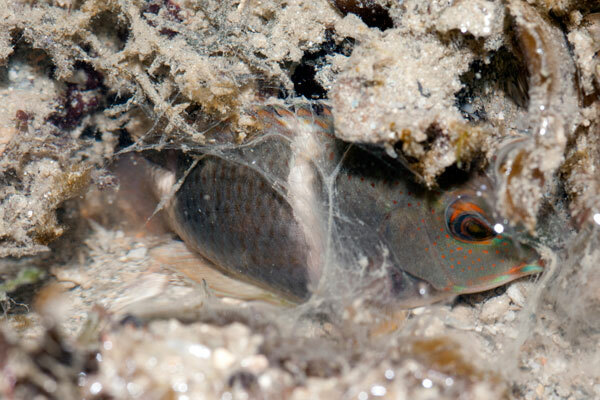 Read more about what the other group saw at Beting Bemban Besar on the Mega Marine Survey blog: Starry Day 7 at the Southern Expedition.